Finding the right mountain bike shouldn’t be a difficult task even though there are dozens available in-store and online. The following review narrows down the best mountain bikes available today by going over key features (e.g. suspension), longevity, comfort, and more. By the end of it, you will have a better idea as to which mountain bike better suits your needs. 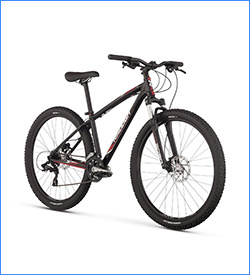 The search for the best mountain bikes begins with the Schwinn Protocol Mountain Bike. It features an aluminum dual-suspension frame and absorbs bumps well. The wheels are 26″, and the anodized alloy rims are made to better withstand tougher terrain. It also has a Promax front disc brake as well as a rear alloy linear pull brake to help you stop in various conditions. 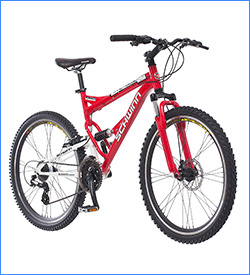 This mountain bike, available only in red, is designed to last, but it’s also backed by a lifetime warranty from the company. When assembling, it may be easier to take it into a shop. The Merax Finiss 21 Speed is built using heat treated aluminum. To increase your amount of control as well as take in the impact of bumps, this bike has a suspension fork of 80mm travel. It uses both front and rear mechanical disc brakes, and it has 26″ double wall aluminum rims to aid in the rolling. You can purchase this bike in three different color patterns: black and red, gray and green, and white and red. It is 85% assembled when you receive it, however, the parts you have to put on are generally easy to apply. 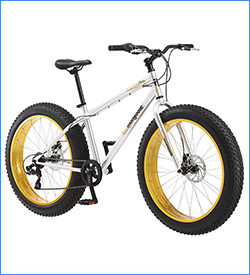 With the Mongoose Men’s Malus Fat Tire Bike, you can experience year-round riding. 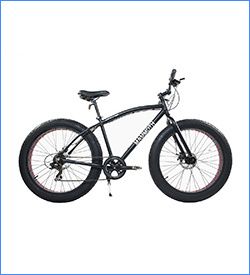 It is built with 4 ½” tires all made on a cruiser-design steel frame. This bike uses 7-speed gearing with Shimano rear derailleur in addition to front and rear disc brakes. 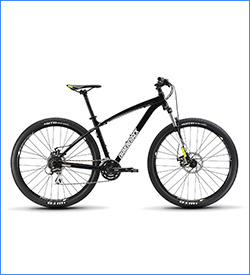 It emphasizes stability and adaptability as you ride over snow, dirt, and sand. Assembling can be done in no time even if you have never put together a bike before. However, it’s important to adjust and grease everything prior to riding if you want the best performance. Next on our best mountain bikes list, we have the Alton Corsa Mammoth that comes with 4″ wide wheels to help it withstand a number of different terrains from dirt to snow. To help you get through that terrain, it is a 7-speed. This also allows for greater control on your end. It features a stable alloy frame that helps supports riders of various weights without actually weighing the bike down. There isn’t too much assembly required with this bike. It can be done with one or two people, but you don’t have to be an expert to assemble or ride this bike. The bike’s only available in a single black color. If you’re looking for something to casually ride along the bike trail or just the neighborhood, the Vilano Mountain Bike Ridge 2.0 can be a good choice. It doesn’t come with a lot of bells and whistles. 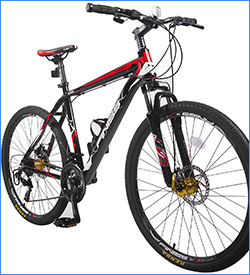 Rather, the bike is a simple mountain bike designed to introduce you to off-road biking. Made with a double butted aluminum frame, this bike a 26″ suspension fork alloy with a lockout. It also has 21 speeds and mechanical disc brakes. It comes partially assembled, but it is recommended to take it to a bike shop for more help. Appearance-wise, it is available in a black and red color pattern. Next on our best mountain bikes, we have a great choice for those just starting out mountain biking that is really easy to control. 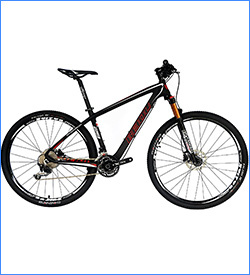 It has 26″ full suspension aluminum MTB frame with a 70mm suspension travel fork. 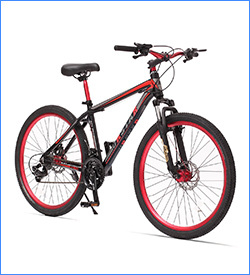 To help with your shifting, the bike has a Shimano 24-speed derailleur and shifters. There’s little worry about stopping thanks to the mechanical disc brakes. This bike will usually arrive about 85% assembled. It is another reason why it works well for beginners as you don’t have to spend too much time reading over the instructions to assemble and tune the bike. You do have two color options as well: purple or black and red. 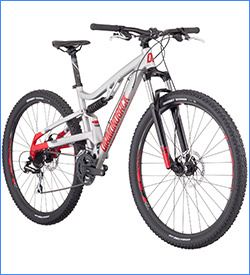 The Diamondback Overdrive is an ideal choice if you’re new to mountain biking. 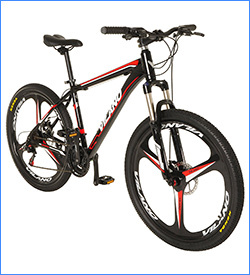 Backed by 29″ wheels, it offers smooth riding, and its hardtail design allows you to climb simple hills with ease. Alongside that is the 80mm suspension travel fork. For climbing and descending hills, you can also utilize the Shimano Acera 8-speed rear derailleur. This provides you with a wide gear range. The frame of the Diamondback Overdrive is made using aluminum, and it comes in a solid black color. This bike is 95% assembled, making it easier for you to put it together and get going. When compared to many carbon fiber bikes, this particular bike from BEIOU is among the best mountain bikes due to its affordability in terms of material used. It is highly durable, so no matter where you ride, it won’t break down on you easily. Although some upgrades may be required to make it more comfortable, out of the box, it still offers great braking power (dual hydraulic discs) and an overall reliable ride. This bike has an air suspension fork, and it comes with 27.5″/29″ wheels. You can select from three different colors when choosing this item: white and red, black, and white. On the Recoil 29er, there is a single pivot design to help the bike maintain its traction. What aids in a smoother ride are its 4″ front and rear suspensions travel as well as its 29″ wheels. Concerning its material, it is made of butted and formed aluminum. It also has a wide range of gears to help you better ascend and climb downhills. For reliable stopping power, the bike has Tektro Aries mechanical disc brakes. You will find that the Recoil 29er is a nice white and red color. It is ideal for beginners, but it can still work for you if you’re a more experienced rider. Topping out the list of the best mountain bikes is the Eva 3 from Raleigh. This bike is designed specifically to suit women for a comfortable, easier riding experience. The custom butted aluminum frame, in particular, has a low standover height. Both the Tektro hydraulic disc brakes and the 75mm suspension fork offer smooth braking power and good shock absorption to handle any conditions. The Raleigh bike arrives partially (about 85%) assembled, so there isn’t much you need to do. Nonetheless, if you haven’t done it before, it doesn’t hurt to see a professional. Lastly, there aren’t color options to choose from. This comes in a simple black color with red accents. To summarize, the best mountain bikes are ones that are relatively easy to handle whether you’re a beginner or a seasoned rider. They should be comfortable and last a good deal of time so you’re not replacing it after a few rides. To make sure you are safe when riding, check out our best bike helmets recommendations. Did you appreciate the bikes that made our top 10 list? Share your thoughts with us in the comment section.